Please stop by, walk through the garden and say hello! We've spruced the garden up for the Hardy Plant Garden Tour, and would love to share. Our garden is open to any and everyone interested, but the larger tour is for plant group members, by prior reservation. (Sunset's Fresh Dirt blog is, unfortunately, no more. Apologies for the broken link). The galvanized stock tank planters on our deck got the attention of Sunset's Jim McCausland during his recent visit. The bamboo screen provides a soft, textural screen for the seating area and a lovely backdrop to the view of the deck from the house. On clear nights, moonlight through the bamboo casts beautiful shadows on our walls. Read about the screen on Sunset's Fresh Dirt. 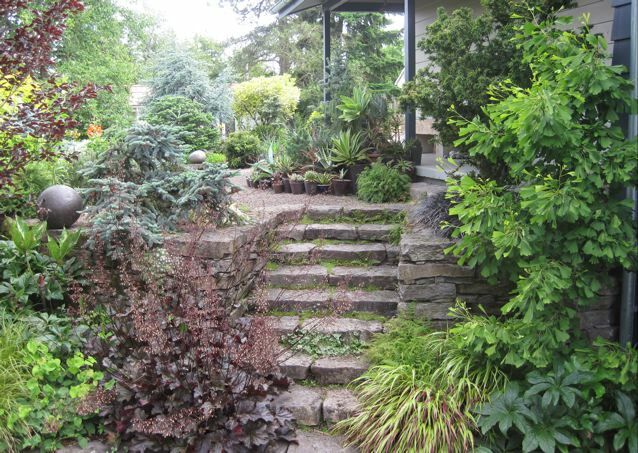 Our new friend, Loree Bohl wrote a lovely, very thorough post about our Open Garden on her blog, danger garden. Judging from some of her other entries, we share a passion for mean plants and cool nurseries, so be sure to keep reading! Buell took some terrific new photos of our garden last night. What do you think? Thanks to everyone who joined us for the Open Garden! We had a lovely day and were delighted to meet so many new friends. If you missed the event, stay tuned to the journal and Facebook for future events. - The galvanized fence was one of the few elements that we knew would be a part of the garden from the start, and it was the first thing we installed. We had a hunch that the brightness and subtle texture of the fence would be an asset in our narrow, urban lot. While metal fences clearly aren't for everyone (it's still the only one we've built! ), we love how it seems to pull the sky down into the space and sets off the dark foliaged plants in front of it. - We built almost everything by hand. From removing tons of concrete (be sure check out the "before" pictures in this post), to hauling each rock to its final location, we held true to our belief that people build better gardens than machines do. 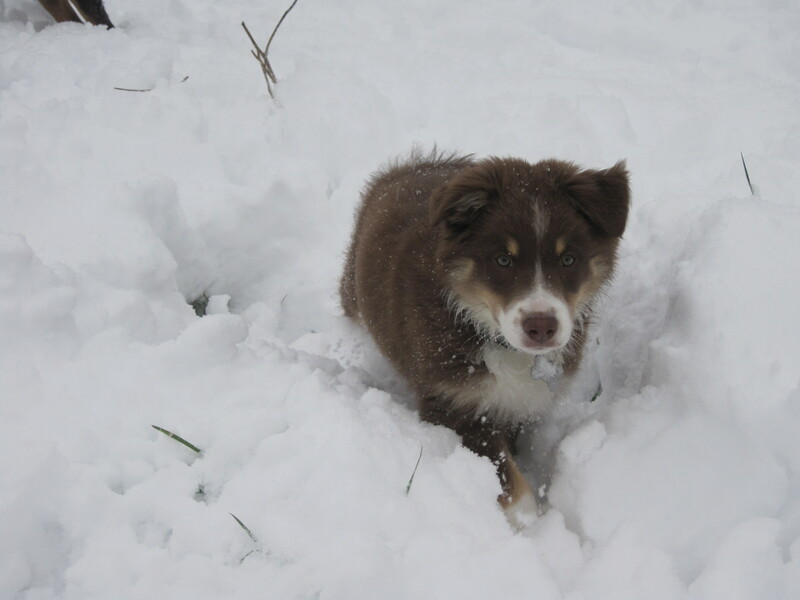 The one major exception was the driveway, which Buell swore he was going to dig by hand.... About 10 minutes with a pick convinced him that using a bobcat would be a better idea. We look forward to sharing our garden with you on July 9. In the meantime, remember to follow us on Facebook for updates, photos and more! Please join us on Saturday, July 9 for an Open Garden! The plants are loving the long, cool spring, and the garden is gorgeous this year. 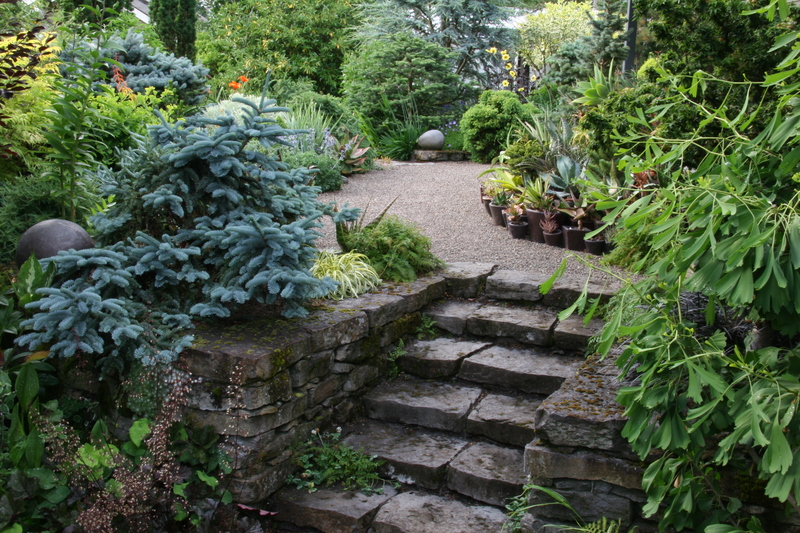 It's a small, diverse space that has been featured in Sunset, Fine Gardening and Garden Design magazines. There's a little something for everyone - sun, shade, dry stack stone walls, seating areas, mature plantings, new additions and lots of design ideas. Buell and Rebecca will be on hand to answer questions about the garden and Mosaic, but, introverts, never fear, we're happy to let you wander on your own. If you don't know our garden, this photo history is a fun place to learn more, and our press page includes several articles about the garden. We hope to see you on the 9th! Drop by anytime between 9 and 2, and feel free to bring friends and family. We'll have limeade and shade if it's warm (or even if it's not), and space to explore or just sit and enjoy the day. Save the Date - Open Garden on July 9! 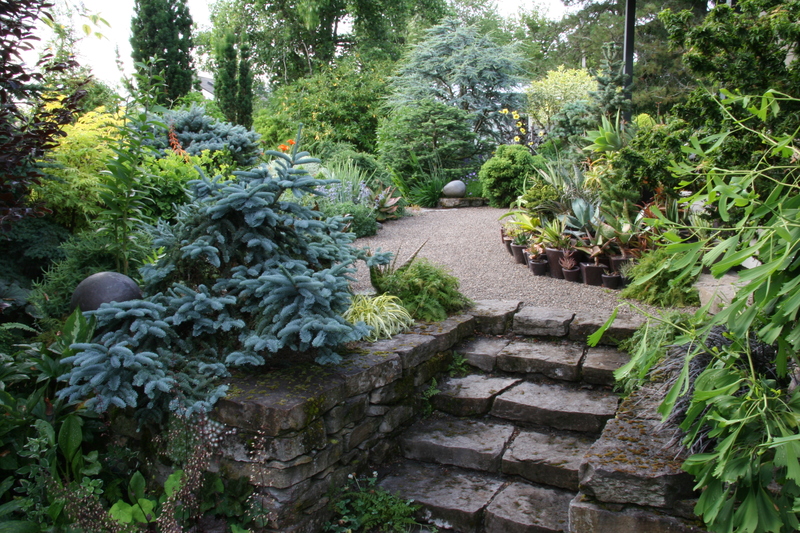 Join us on Saturday, July 9 for an Open Garden! Our garden is gorgeous this year, and we want to share it with you during its peak season. Please join us to walk through the space, ask questions, say hello or just enjoy some limeade in a pretty spot. If you've seen the garden before, you may be surprised at some of the changes. As it has grown older and shadier, we've changed and simplified some of the plantings, to what we think is an elegant effect. Of course, the maturing specimens and beautifully aging stonework don't hurt, either. Our little space offers a wealth of ideas for gardens of any size or age, and, of course, Buell and Rebecca will be on hand to chat and answer questions. We are working on a newsletter for you, but in the meantime, we thought we'd post a couple holiday-appropriate shots of our grill. We built the stone and interior fire brick and designed the custom metalwork. 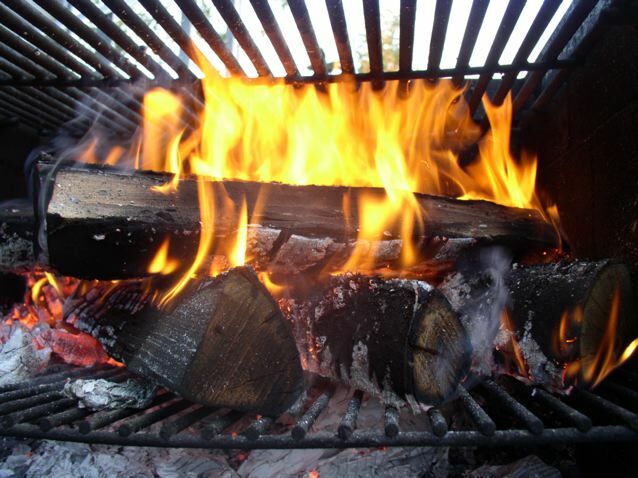 Although it would work with commercial, bagged fuel, we think oak and fruit wood make for the best flame and flavor. When it's not in use, the simple lines and intricate stonework make the grill right at home in our garden. 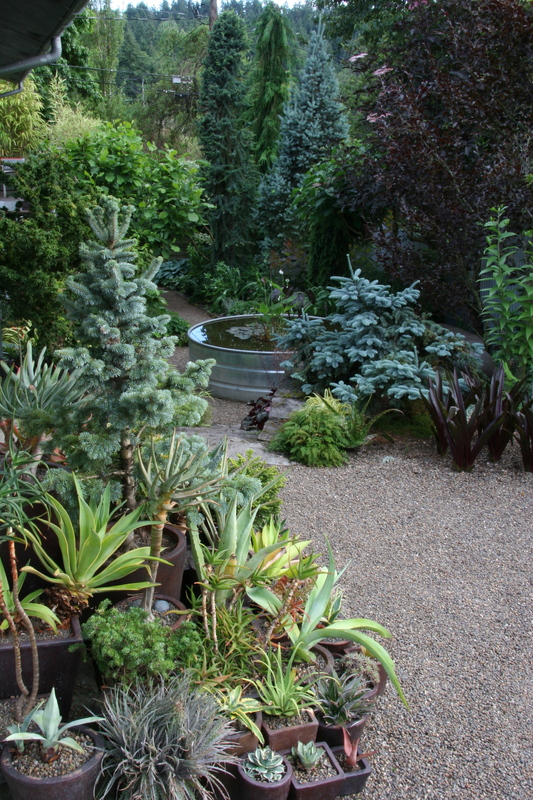 Buell arranged our succulent and conifer containers last night. The arrangement looks great, hunh? Finishing that arrangement feels like the beginning of summer, our garden's best season. These little pots make a big feature at the center of our upper gravel terrace, and a strong focal point at the top of the stairs from the stock tank terrace. In many cases, we advocate using large containers to anchor your potted arrangements, but enough small containers can have a real impact. These containers range from around 6 inches to around 20 inches in height. Most of them are hand-coiled Vietnamese pots with an ash glaze, but there are a few odds and ends that we've picked up over the years. Some of our favorite garden visitors are birds. The garden moves with their hopping, fluttering and bathing and their songs and twitters are a soundtrack for our work. Part of the fun of watching birds is that you never quite know what they'll do next. Yesterday, Buell saw a jay dive into our stock tank pond and paddle around, hop out for a moment and then do it again! 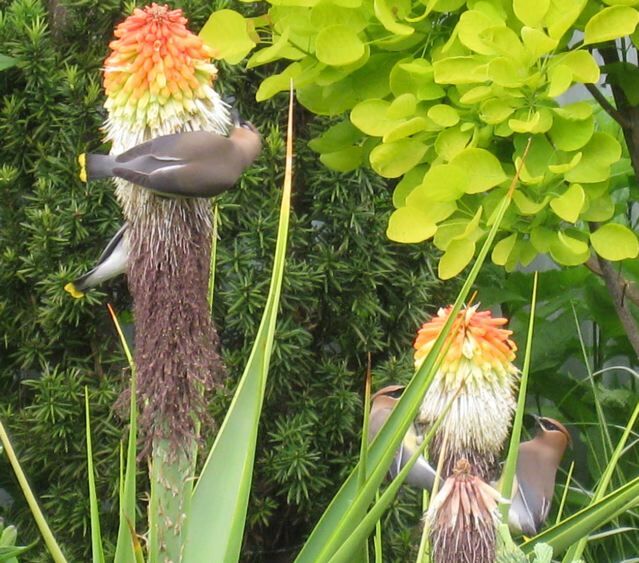 Kniphofias are usually a hummingbird thing, but two years ago, waxwings mobbed our Kniphofia northiae flowers. There are a few plants that bring birds back year after year. Many of them are well known, but here are three of our favorites that may not make the common lists. Sambucus - Our 'Black Beauty' flowers and fruits reliably, and is absolutely covered in waxwings when the berries are ripe. Salvia guaranitica 'Black and Blue' proves that hummingbirds aren't complete color snobs. Its deep blue flowers vibrate with hummingbirds throughout the summer. Interestingly, we've found that while newer plants will die in a hard freeze their first winter or two, established plants survived even last year's serious cold snap. A last word on birds: our native bird populations are dwindling, particularly the species that forage on or near the ground. There are many, many reasons for this, and there are many ways to help. Planting bird-friendly gardens and using few or no pesticides (organics first, please) are a great start. As far as the birds are concerned, the more bugs the better! Another thing you can do is to bell your cat or find another way to minimize their bird kills. We love cats, but a few of they are not native to our area and the native birds have not evolved the tricks to escape their efficient hunting. We also minimize cat (and raccoon!) traffic in our garden by netting off their favorite pathways and blocking off the gaps under our fence. Container plantings are a great way to add whimsy, color, screening and focus to "hard" areas of your garden, such as patios and decks. Somehow, though, while gardeners enjoy the initial rush of buying and planting, they are often underwhelmed by the result. 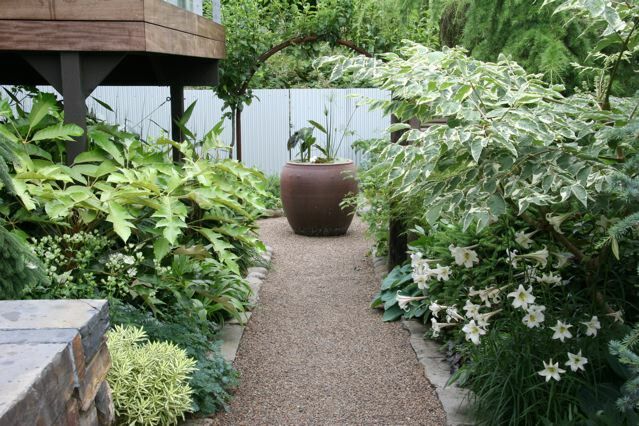 While we have plenty of ideas about the best plants and styles of planting for containers, how to plant them, and so on, we think the most important aspect of container plantings isn't the plants at all.... Here are a few ideas for finding and laying out the perfect containers for your project. We're loathe to use the word "pots," when great containers have been made from stock tanks and garbage cans (AKA dustbins). Bigger is usually better. 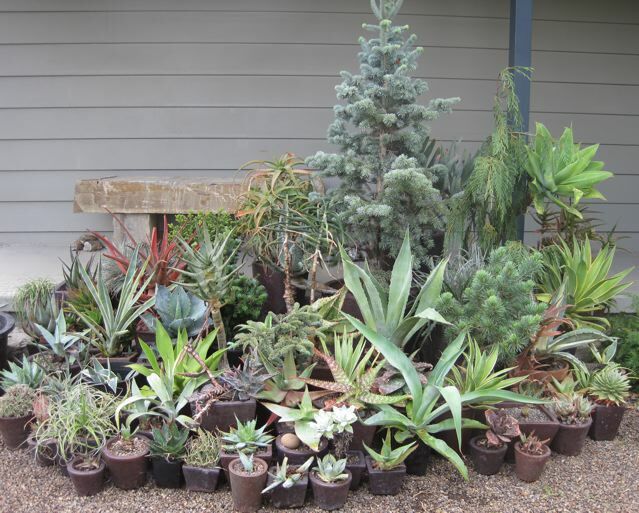 We like to cluster a few pots of various sizes. Often the tallest pot in our clusters is 36". 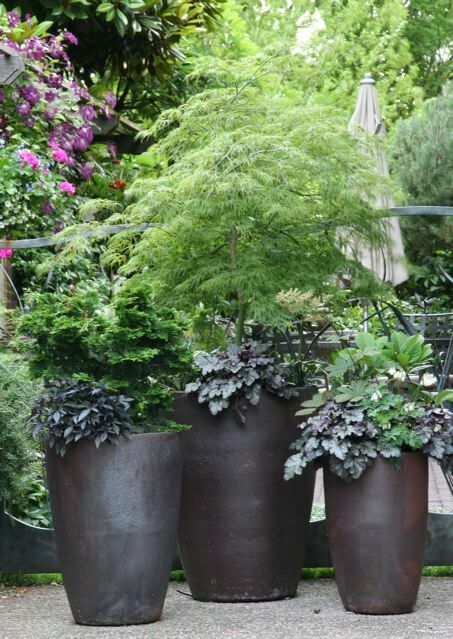 Taller pots bring the plants closer to eye level, rather than calling for attention from knee height. We've said it many times before, but simple forms are the way to go. 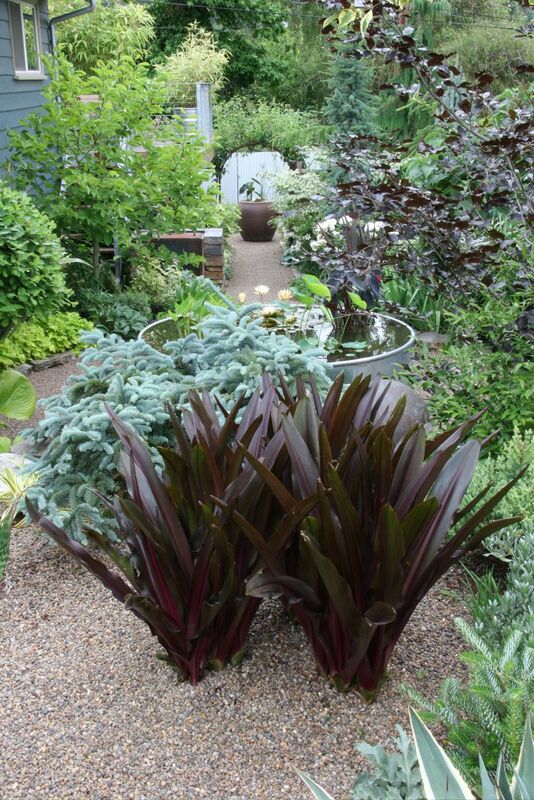 Ornate pots create a busy visual effect that distracts from the cool shape of the pot and all of those great plants. Pull it all together. Rather than spreading your containers out, one here, two there, cluster them together. Even small pots can have a big impact when drawn into a big mass. Location is always key. 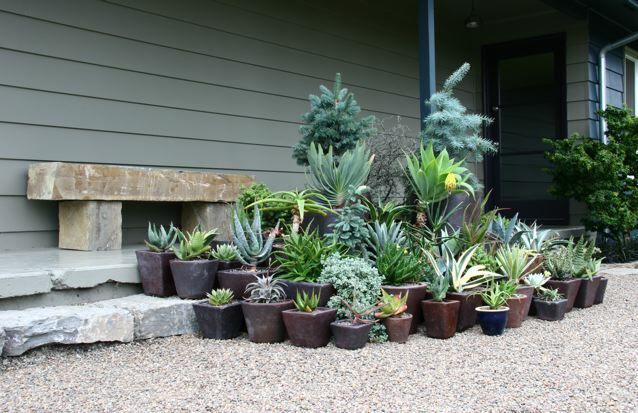 Take time to find the perfect spot and layout for your carefully selected containers. Prioritize the views from important windows, doors and paths, and spend time moving the empty vessels around before you start to plant. A few inches to the left or right might help everything come together perfectly. Summer is coming. While the wet, cool weather has many people wondering if the April showers will end by July, the plants are quietly preparing to surprise us in warmer days to come. 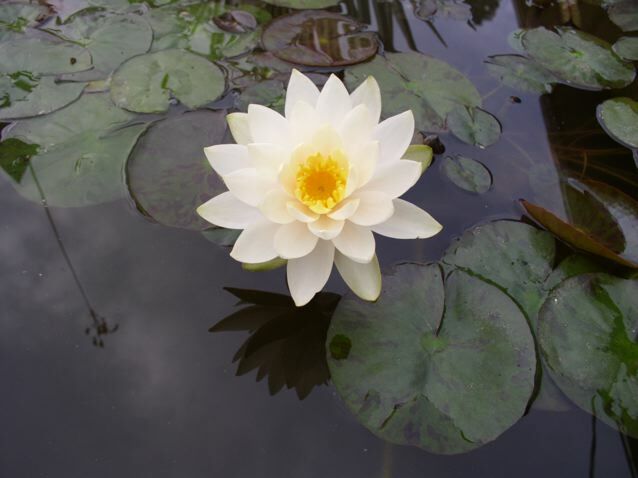 I saw our first waterlily bud this weekend, and the heat-loving plants have pushed a surprising amount of growth in the last week or so. It's possible that this rainy spring will bring us a summer to remember. We hope our last newsletter was helpful in your spring garden work. If you haven't checked in since then, we expanded on our spring cleaning theme with a little about gardening tools, ideas for growing food in busy lives and tough spaces, and tips for making a beautiful garden scene. Beyond those ideas, we've posted some neat photos, a winter post-mortem and more, so be sure to scroll through the journal when you're done. 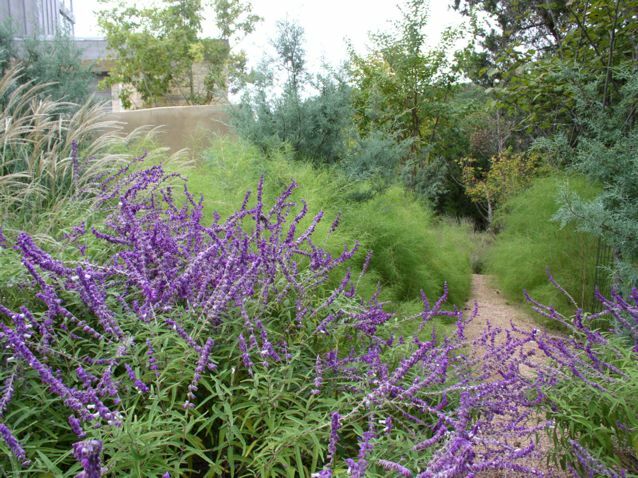 In this newsletter, we'll discuss how we use color, texture and form to select and place plants in our gardens. The terms color, texture and form are used together so often in articles, books and lectures about planting design that they are almost cliche, but what do they mean for your planting design? Even a quick survey of online articles shows a huge variety of ideas for designing with those terms in mind. While one designer may prioritize flower color and structure, another focuses primarily on the texture and shape of leaves. In our work, color, texture and form carry equal weight, and we have strong ideas about the best way to see and use each one. We select our plants to create a cohesive palette, sometimes subtle, sometimes high-contrast, that reflects the desired style and mood of the space. Because the possibilities are endless, and the results should reflect you and your aesthetic, we will focus on how we think about color, texture and form, leaving the nitty-gritty fun of building a palette to you. Foliage first - While flowers are fun and part of almost every garden, foliage color is the foundation of our plant color palette. We use foliage to create sweeps of color throughout the year, or at least the growing season. The colors vary from bold, contrasting spots of yellow and purple to accents of silver and burgundy to shades of green. Know when to hold 'em - Even in a bold palette of strong, bright colors (restraint does not mean boring), restraint is key. We intentionally leave out some colors or save them for another area. 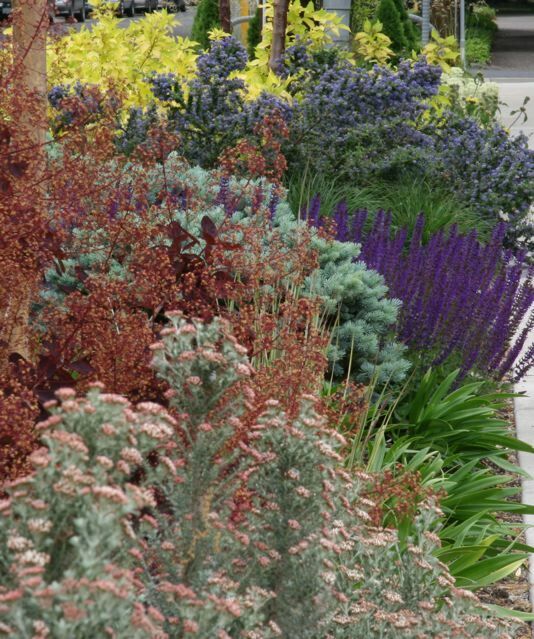 If you love every color, or are the sort of person who can't leave a good plant at the nursery, try using different palettes in different areas of the garden. As you can see in the first photo, our front garden has lots of bright, hot color, while the side garden, at right, tends toward gentler pinks, blues, creams and whites. What are we talking about here? - What we mean by "form" is the overall shape of a plant - upright, round, conical, weeping, arching, and so on. Sometimes form and texture overlap, as in spiky plants, like iris and Phormium, but for the most part, form has more to do with outline than texture. Round, rounded, roundish - Every plant has a form, and some are stronger than others. Not all strong forms are geometric, but those are the easiest to discuss. For example, lots of plants have what we call a "roundish" form, where the outline more or less radiates around the center. Other plants have a more perfectly rounded outline. 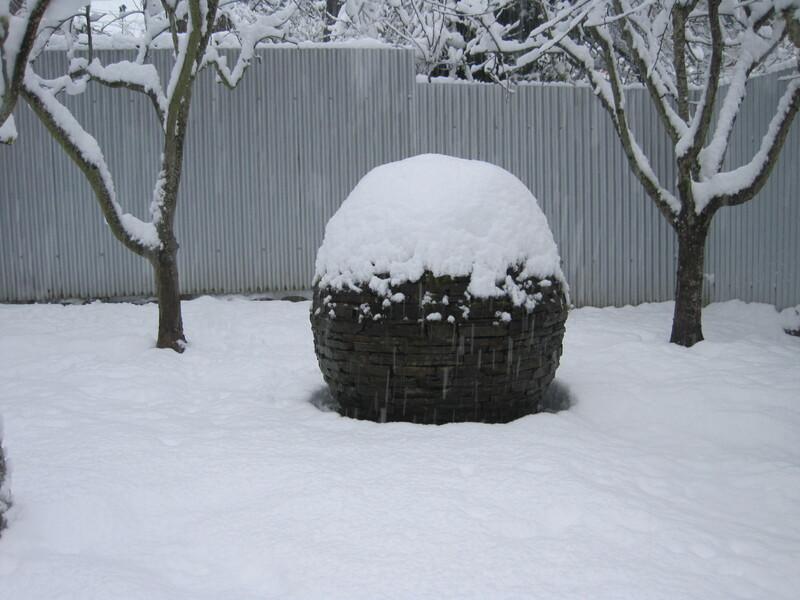 Picea sitchensis 'Papoose,' for instance, is almost spherical. A stronger form makes a stronger statement in the garden, and can be used as a structural, almost sculptural element in planting. We will shear some plants, like boxwoods and fine foliaged conifers, to tighten and perfect their form. The dance - In many of our gardens, we select a plant with a strong form and "dance" three to seven of them through a layer of lower plantings. 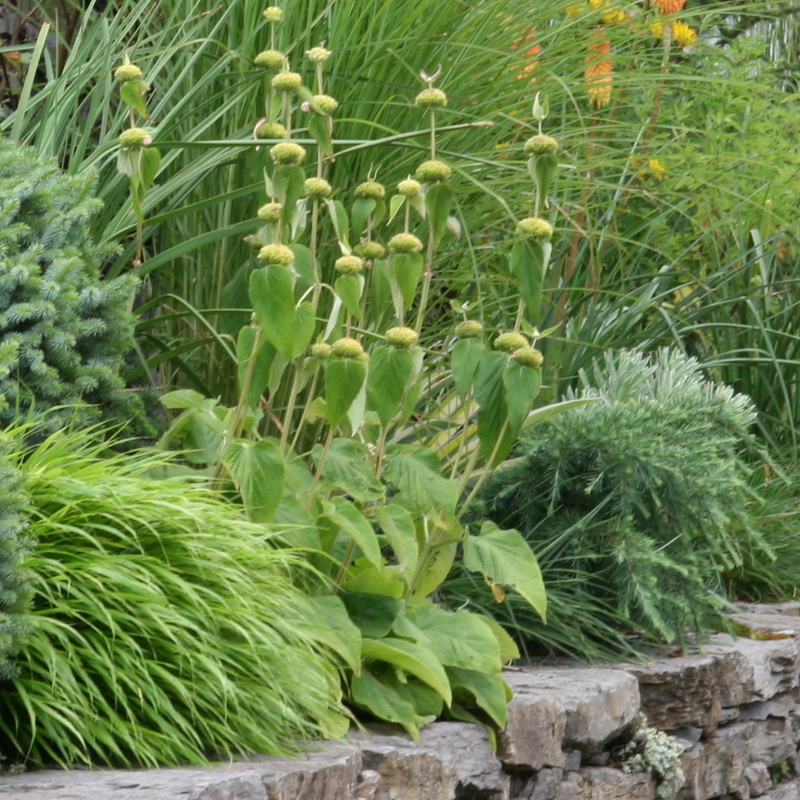 The repeating, usually evergreen, forms have room to shine, while the lower plantings add seasonal contrast and interest. That's all for now, folks! We'll be back over the coming weeks with more ideas and, everyone's favorite, new photos, so please check back soon. Oregon had quite a freeze this winter! 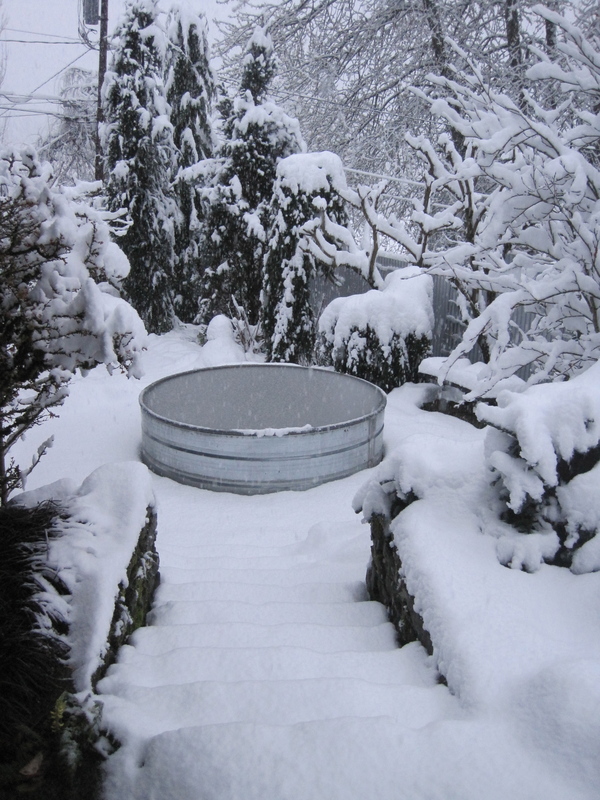 Temperatures in most areas fell into the single digits, and the cold took its toll on our gardens. Although we certainly lost some plants, others were tougher than expected, and a few are starting to sprout from the roots only now. We suspect a few more may peek out before all is said and done. Below are just a few notes from our observations. One of the great mysteries of gardening is how a plant can survive one place, but not another. Eucomis 'Sparkling Burgundy' is emerging vigorously in an in-town garden and a garden off of Dillard Rd, but it is completely gone in our garden. It was in a perfect, well-drained spot. We're thoroughly baffled, and planning to replant, but we'll miss the big show this summer. All Phormium were lost. Last winter, many suffered or died due to cold, but I don't know of any that survived this year. We love bronze Carex, although most have a shortish attractive life span, even in mild climates. 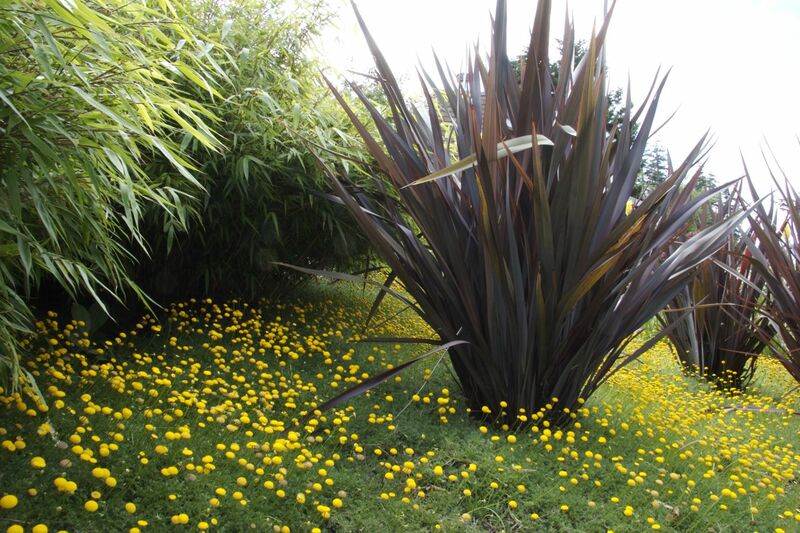 This winter, we lost almost all bronze Carex in our garden and our clients gardens. One notable exception was a well established mass of C. flagillifera that survived, looking great, in a cold garden in the south hills. Many Miscanthus (maiden grasses) took a hit, especially those in newer plantings. We're trying to find further rhyme or reason for which lived and which died, but so far have not had much success. In some cases, the failures were in a grouping of otherwise fine plants! Most Gunnera froze back to the roots, but seem to be sprouting... slowly. Given the mature size of Gunnera, we're not sure that starting over is a bad thing. 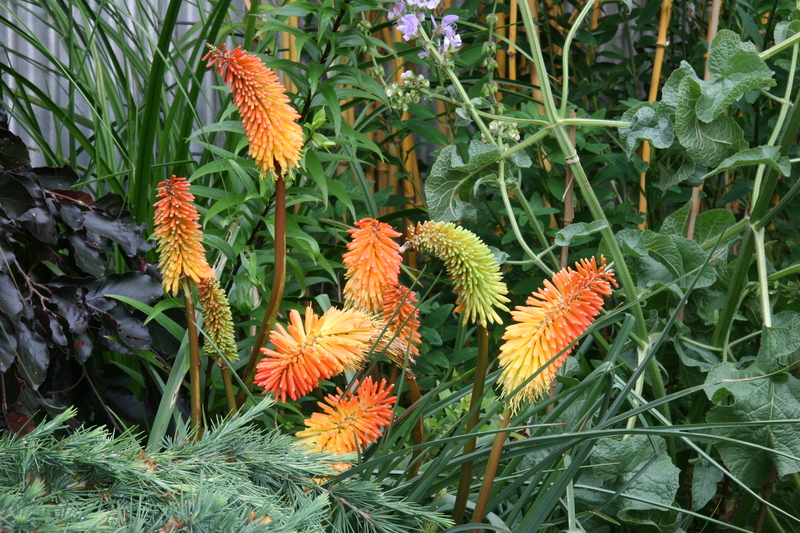 Kniphofia were another mixed bag. K. northiae froze to the roots, but seems to be creeping back in most cases. Other varieties are hit and miss, with a higher percentage of misses among less established plants. We had little hope for the Agapanthus in our gardens, but a few did pretty well. Agapanthus 'Storm Cloud' survived reasonably well, but 'Ellamae' was a complete loss. Here's an interesting one - Salvia g. 'Black and Blue' does not survive most winters.... *but* the few that have managed to become established are quite alive and well this spring. Phlomis russeliana seems a-o.k. everywhere. P. italica and P. fruticosa were knocked back pretty hard, but survived. We expect that the pretty, but tender P. lanata is lost again. Many Ceanothus were just on the line... the ones in warmer areas made it reasonably well, while the more tender varieties suffered in the cooler hills. Our shade plants seemed to be in great shape, overall, even those that are supposedly in the same USDA zone as sun plants that perished. Two of our favorite evergreen shrubs, Viburnum awabuki and Trochodendron arailoides hardly missed a beat. I don't think we lost a single clump of bamboo (mainly from the genera Phyllostachys and Fargesia). Herbs: At least some upright rosemary seemed to weather the cold fairly well where almost all prostrate rosemary are goners. Too bad, as we prefer the prostrate for cooking! We lost our thyme, but the sage, oregano and even bay (!) survived. Vegetables: The kale and carrots have provided us some wonderful overwintered veggies, and our garlic is going strong, but the broccoli is long gone and our cover crop of small-seeded favas are nowhere to be seen. If we think of more losses and surprising survivors worth a mention, we'll add them to this post. Of course, if you have any additions or comments, we'd love to read them! In our most recent newsletter, we promised to offer ideas to make gardening more fulfilling. For us, nothing is more fulfilling than bringing in the harvest from our orchard and veggie garden. The size of the harvest - buckets of apples or a handful of fresh herbs - isn't as important as the connection to our garden and our food (although the food itself ain't bad). We talked about designing veggie gardens in an earlier newsletter, but not everyone has the time, sunny space or inclination to devote to a full-on orchard or veggie garden. Whether you're a serious veggie gardener or an aspiring gardener in an apartment, here are a few ideas for incorporating food into busy lives and small spaces. Herbs - Anyone with sun can grow culinary herbs, many of which are pretty ornamentals. Trailing rosemary and thyme can spill over borders, walls or the edge of a container, and other herbs, like upright rosemary can be sheared into cones or other shapes. Bay is an attractive broad-leafed "foundation" for an herb or veggie planting (ours even survived the single digit temps!). Consider foliage texture and color in placing your herbs, and you may find that your herb garden is a year-round beautiful corner of your garden. Alliums - One difficulty with growing vegetables and fruits is that so many are high-maintenance plants. The little divas want to be staked, watered, thinned, and otherwise coddled more often than many busy people can handle. Alliums, such as garlic and onions, on the other hand, are low-key, low-maintenance, and low-water. They only require attention two or three times a year, and they rarely or never need additional water. They can be harvested throughout the season and dried, letting all of your "hard work" last into the winter! (Question - Has anyone planted edible alliums around deer? We know ornamental alliums are rarely, if ever, browsed by deer, and we've heard that edible alliums are often ignored as well. What's your experience?). Containers - Some veggies and fruits make beautiful container plantings. The striking silver foliage of artichokes and cardoons, for instance, are beautiful with annuals (as in the photo at right) or with trailing herbs, nasturtiums and purple basil. If your sun or space limit you to a container veggie garden, consider arranging your pots with an eye towards foliage combination, and perhaps add a few low herbs or annuals to spill over the edges. One of our friends had a container veggie garden on the deck of her second floor apartment. With peas climbing the railing and lettuce in hanging baskets, she packed a lot of food and beauty into a tiny space. Thanks for reading! We hope you're enjoying your gardening (veggie and otherwise) and the nice weather. 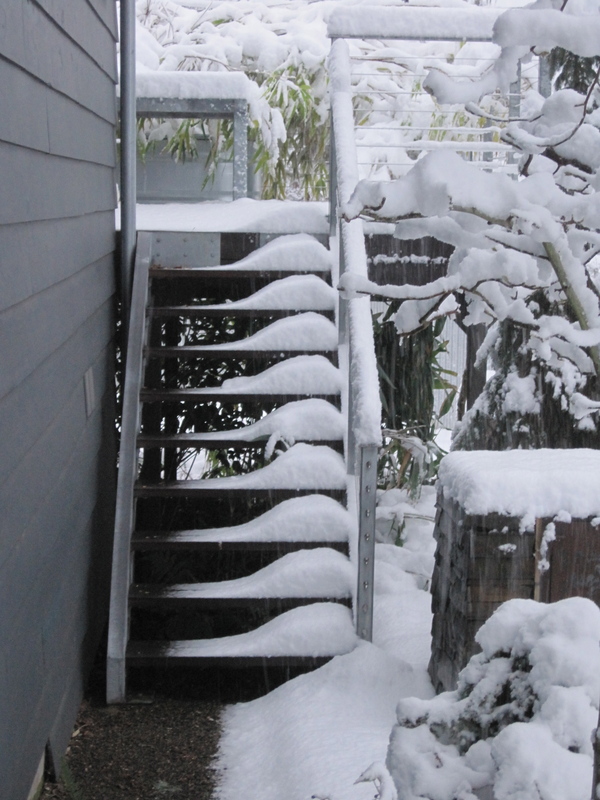 We'll be back with a post-mortem from the hard winter freeze and another spring cleaning idea. For many gardeners, spring brings opportunity to add to their gardens - all those colorful, promising pots at the nursery, a piece of garden art, or that new idea from Sunset. For us, it's the perfect moment to subtract. We look for plants that are overgrown, declining in old age or are just-not-right, and off they go to a new home or the yard debris bin. One of our greatest design assets is our willingness to start over, on one plant, a whole bed or a whole garden. There are almost always better solutions waiting to earn their place in a garden. Subtraction doesn't need to stop in your planting beds, Our clients are amazed at how much better their yards look after the demolition phase, when we've removed not just non-performing plants, but low borders, unnecessary hardscape, and crumbling garden art. While "demo" doesn't need to be extensive, an empty palette is a relief and an opportunity to create a better, simpler, more beautiful space. Filling a hole in a bed can feel a little daunting. In our plantings, we've don't look far for our first ideas. 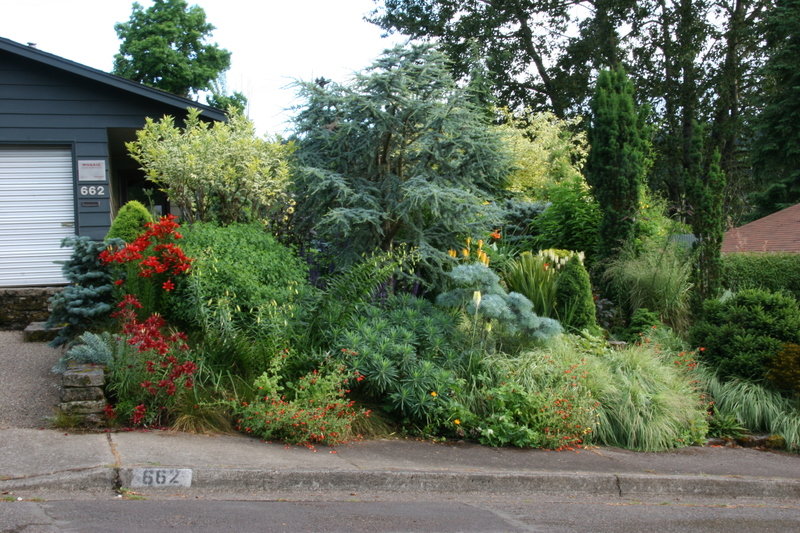 We consider what plants in that bed, or similar nearby beds, are thriving, and work from there. Often, we're able to incorporate and expand on a nearby success story. In new beds or just filling in, planting in groups of three to forty creates a coherent, rich palette with the added bonus of lower maintenance. You can create waves of year-round color and texture by selecting the best performing plants for your space. 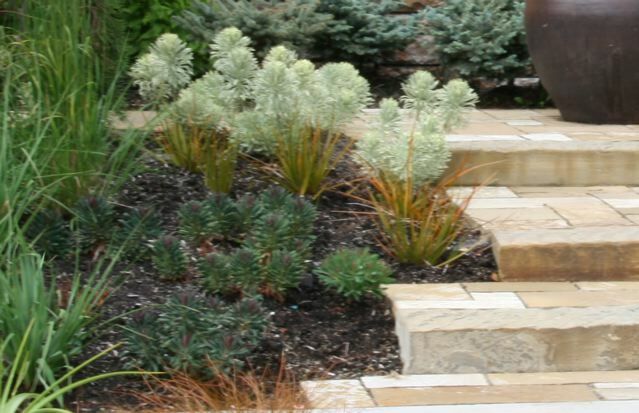 Beyond planting beds, we believe in simple features and clean, strong lines in the hardscape (a concept that needs its own newsletter or three). 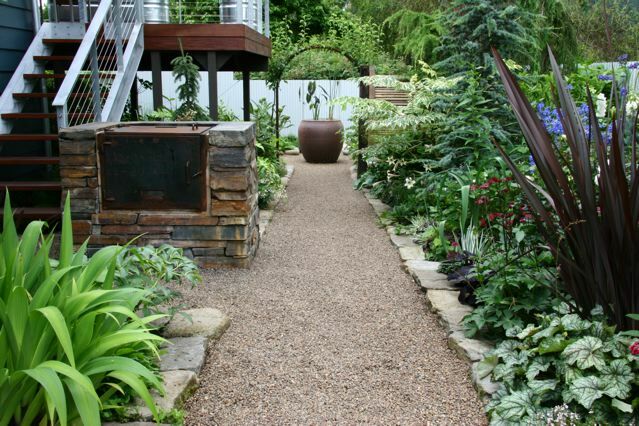 Simplifying the "hard" elements of a garden doesn't require a complete remodel, however. Most spaces have elements in which a little simplification would go a long way. The edges of lawns are one place to consider. Could a straight or curved line make the lawn a simpler, more pleasing shape? What if you were to cut out that peninsula of sod, and connect the surrounding beds? Consider paring down or reorganizing anything that adds clutter to your space. From pots to garden ornaments, we sometimes just have too much stuff. Did you know that some good gardens never make it past the magazine editors, because they have too many little distractions in the beds, around the seating areas and everywhere else? 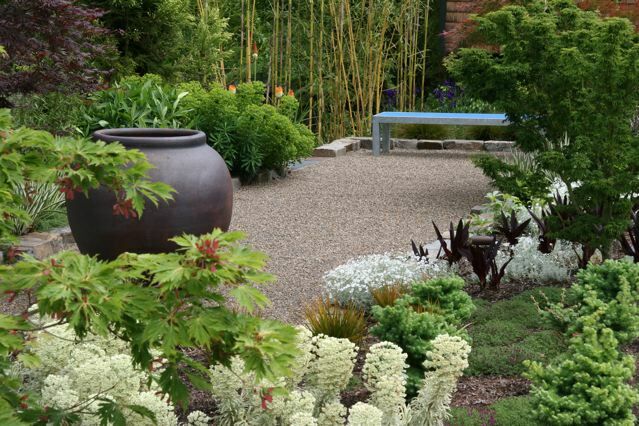 Removing a few things and concentrating others into an higher impact feature will focus attention on the best parts of your garden, rather than distracting from them. The collection of pots in the photo of our bench, below, "works" because we clustered them together at an important spot. Comfort - make sure seats and benches are comfortable, substantial and stable. Take time to level the seats and their foundation. Breathing room - broad paths and open seating areas are more inviting and don't get lost in the summer jungle. Quality - do your homework and prep work before laying a path or any hardscape. 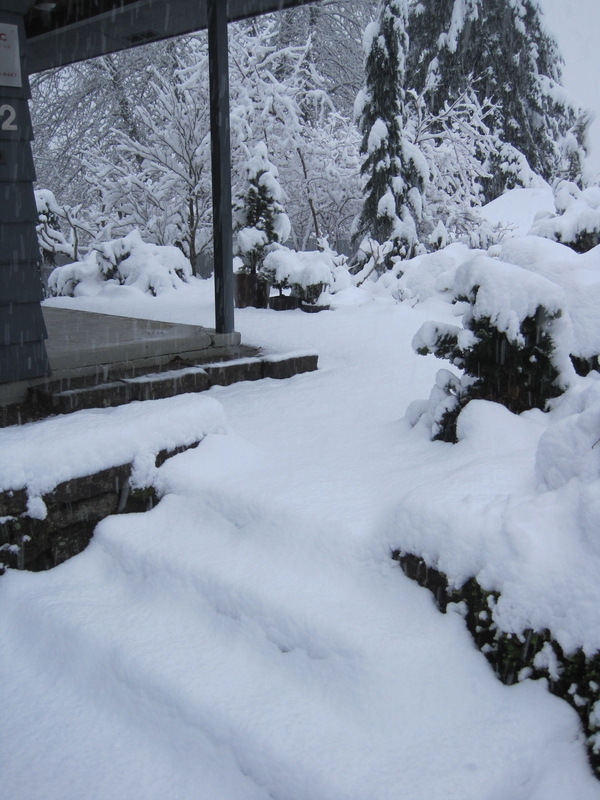 Solid footing is vital, as unstable, uneven surfaces can keep people away. When we first planted our garden, we gave our plants a running start with great soil, a little food and plenty of water. As the plants established good root systems, most showed little stress in hotter, drier periods. A few plants, however, would wilt and crisp at the tips if we didn't increase the irrigation. For awhile, we watered enough to keep those plants, if not happy, then not miserable or dead. But somehow it didn't feel right to irrigate an entire garden to accommodate a few plants. Eventually, we decided to water less frequently. If an established plant couldn't handle the drought, it died or found a new home. Today, our garden is full, diverse and lush, and we're thrilled to use a little less of a precious resource. We wrote about using less water in another post, which we hope you'll read, but the concept is simple. Most of us water more often than most of our plants require. Try waiting an extra day or two between watering cycles this summer. While a few plants will decline, you will probably be surprised at how many plants are up to the challenge. 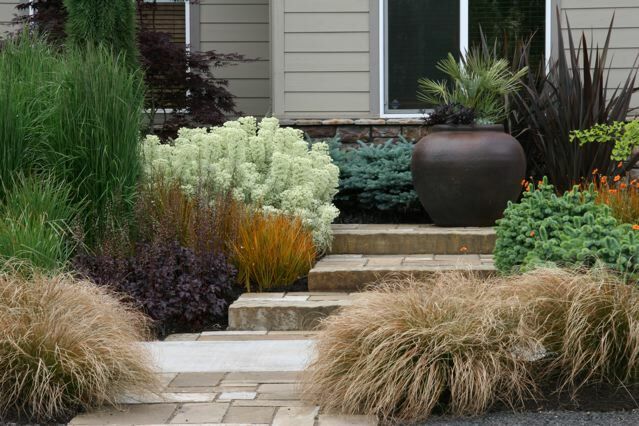 You may even find that some plants, like ornamental grasses and some conifers, prefer less water. We hope we've offered a little inspiration for your spring cleaning. Over the next few weeks, we will share a few more ideas for developing your garden, so stay tuned. If you're ready for more ideas now, take a look back at our fourth newsletter. Spring always brings lots of ideas, photos and news, and we look forward to sharing them with you! Sometimes, a garden needs one final touch to bring it together. When that final element can be a functional table, bench or chair, all the better.... We have designed custom furniture for a few of our gardens, a feat that inevitably requires more time, effort and head scratching than we could imagine. Those big stone benches require a little sweat equity, as well. Somehow, the results are always enough to make us willing to dive in again. Design thought: most of us spend more time in our house than in our gardens. Taking the time to create beautiful scenes through important doors and windows will reward you dozens of times a day. We often center features or hardscape elements on the primary views form the house, but a less formal, thoughtful organization of space can capture your attention just as well. At first glance, the geometric structure required by the way most of us garden (rows of vegetables in rectangular or rectangular-ish raised beds, surrounded by straight paths) may seem limited, but a little thought and creativity offers a range of solutions and feelings from formal and sculptural to whimsical. We consider the necessary rectangular forms and pathways a jumping off point for design, rather than a limitation. 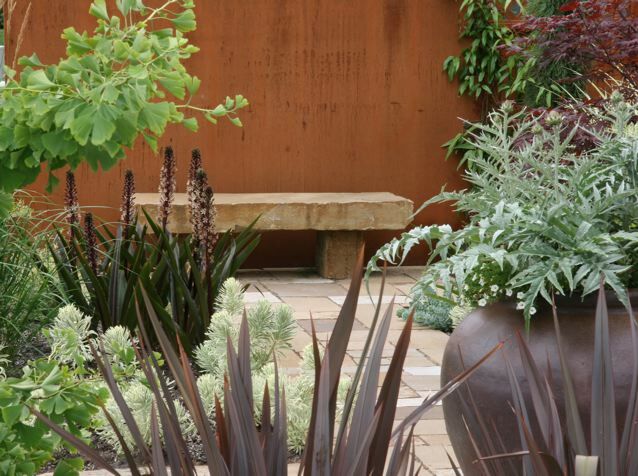 Once we've got the basic form in mind, we consider materials for borders or retaining. 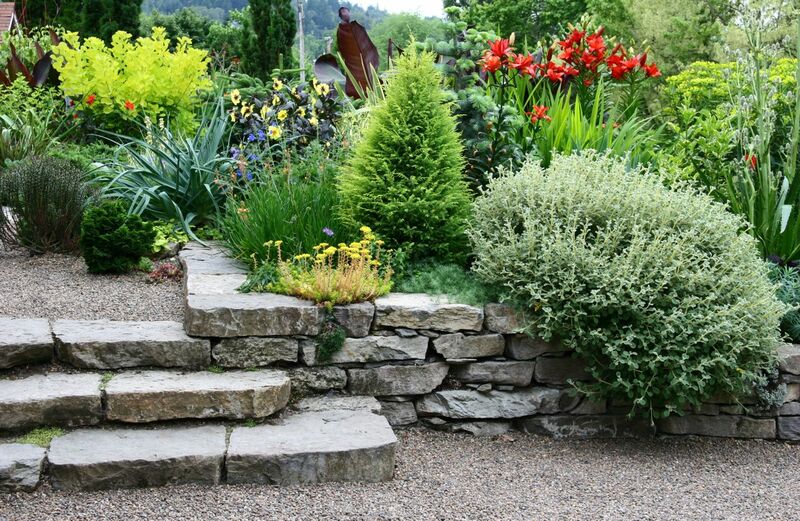 Stone, metal, and wood all present a variety options for finishing the structure of a garden. In our garden, the best space for the veggie garden was in a lower, sunny corner of our property. The straight lines of the paths and circular "roundabout" continue the overall design of the ornamental garden, and the pea gravel paths and surrounding corrugated, galvanized fence emphasize an overall continuity of materials. Rather than continuing to use the rough, straight edged basalt that forms the borders, walls and stairs of our ornamental garden, however, we bordered our raised beds in large, round river rock. The river rock softens the lines of the veggie garden, and playfully frames the herbs, strawberries and other low plants that spill over the borders. 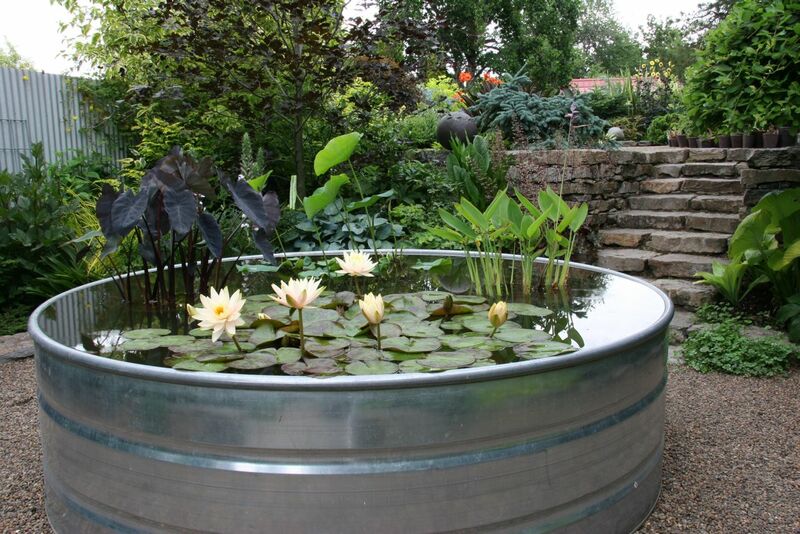 The aesthetic center of our veggie garden is the Vietnamese urn water feature at the intersection of our main paths. The urn is visible from the upper garden and punctuates the long axis of our narrow space. The circular space around the urn cuts into the straight lines of our raised beds, at once playing off of and playing with the surrounding, mostly rectangular, geometry. Our space reflects our desires and priorities (cohesiveness of design and maximizing usable space, among others). The veggie gardens we have created for clients vary with their goals. One client was a busy mother with a strong design sense. She wanted to involve her young boys in growing some food, but she was more interested in having a "sculptural" garden that was easy for her and the boys to work than in maximizing planting space that she would not have time to maintain. We built three long, narrow, rectangular raised beds from dry stack basalt. 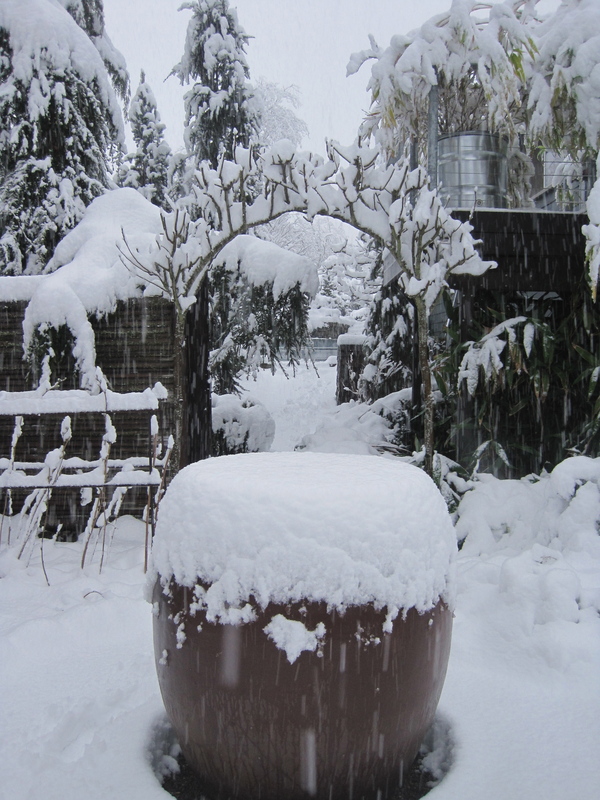 Their unusual forms look great even in winter, and grow gorgeous peppers and other heat-loving crops in the summer. Another client wanted a simple, contemporary box for their veggies. The catch was their request for a portable design they could take with them if they moved. We bolted ipe (a sustainably forested tropical hardwood) to rusting metal corners, which extended below the wood and doubled as stakes to hold the box in place. There are so many more ideas and materials to try, and we love the challenges and rewards in designing vegetable gardens. 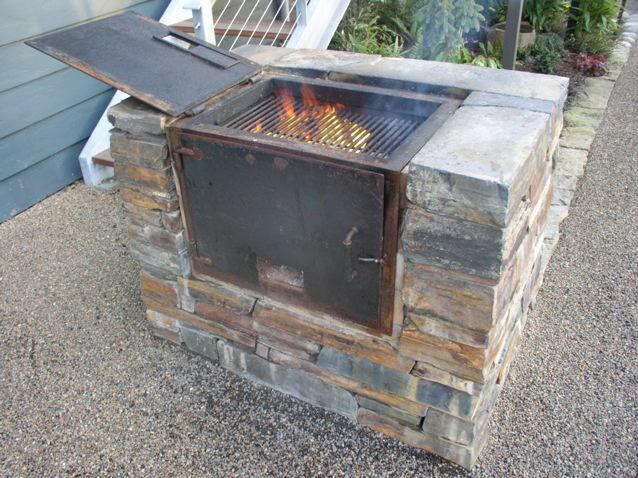 Just the ideas for retaining (vertical flagstone, rusting metal, how about a mini-gabion wall?) seem endless. Each space and lifestyle offers challenges and inspiration for design well outside the ubiquitous cedar box. We love growing food. Our veggie garden and orchard take a third or so of our usable garden space, and we dream of having more space to grow all of the things that we can't cram into our little property (brussels sprouts! pumpkins!). That said, our expertise is in landscape design and construction, not in producing food, and what success we have in growing fruits and vegetables is due in large part to research and strategic questioning of farmers and home gardeners many times more experienced and knowledgeable than we are. Below are a few of our favorite resources. We'd love to hear about yours! 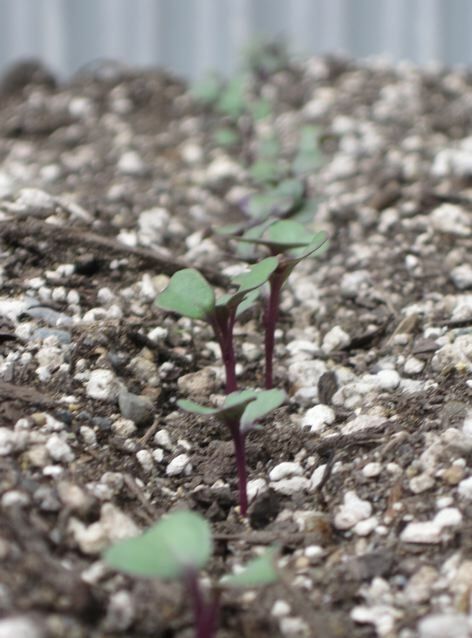 Growing Vegetables West of the Cascades by Steve Salomon - Everything from planting calendars to best varieties for our area.... This is the Willamette Valley veggie geek's best friend. It has awfully high expectations for those of us on smaller lots, and we would quibble with a few particulars, but our copy is dirt smudged and dog-eared for a reason. Territorial Seed Company - Seeds and starts grown in Oregon, with many organic options available. One of our greatest early season joys is the March delivery of the year's seeds. The Oregon State Extension service - lots of information on fruits, vegetables, pests, and regional differences. We just found this cool pdf with information and planting calendars for different regions of the state. Robin Bachtler Cushman's photographs are terrific inspiration. She chronicles our local farms and vegetable gardens. If you happen to be on the LCC campus before September 21, her work is part of a show, "Markets," at the David Joyce Gallery. These are just a handful of the terrific local and regional resources, including many exceptional home gardeners who are happy to share their experience and advice with the rest of us. Thanks for keeping up with us! Fall is a wonderful time to be outside, and we hope the next month brings plenty of beautiful weather for gardening and other adventures. For more Mosaic news and images, like us on Facebook, and follow us on Pinterest and Houzz.